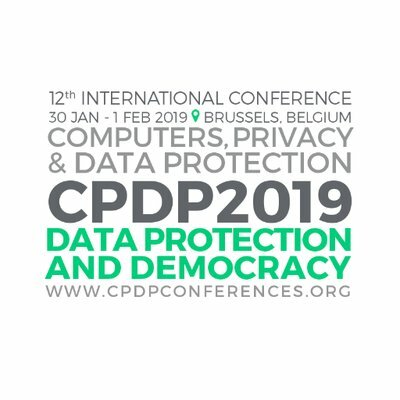 Stefania will be in Brussels to take part in the Privacy Camp and in the Computer, Privacy and Data Protection (CPDP) conference, in Brussels at the end of January. At Privacy Camp, on January 29, Stefania will join Mirko Tobias Schäfer (Utrecht Data School), Minna Ruckenstein (University of Helsinki) and DATACTIVE former postdoc Jonathan Gray (now at Kings’ College, London) for a discussion on Reimagining Data Futures: Data and Agency. At CPDP, Stefania will join a panel on “Data is (Political) Power!” (Wednesday 4pm) organised by IViR & ASCoR (UvA), with Daniel Kreiss (University of North Carolina at Chapel Hill), Julia Reda, EU MEP, and Jennifer Childs (ICO). On Friday, she will also contribute to an amazing session of the artistic program, entitled Micro-Targeting and Tactical Fiction, featuring Manu Luksch (!). Check out the CPDP program!